Shifting or sinking concrete in your driveway, patio or pool deck? Trust Concrete Raising Corporation, Houston’s authority on sidewalk and driveway repairs since 1994. 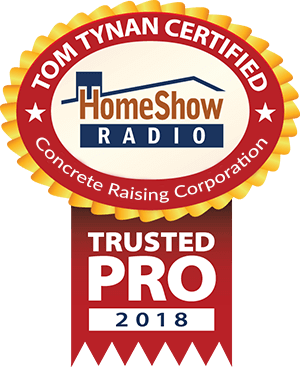 Whether regular maintenance or preparing a house for sale, a free quote from Concrete Raising Corporation provides options that’ll save you money and time. Their trained professionals know exactly how to carefully drill and pump a grout or polyurethane mixture underneath your concrete to raise your sidewalk, driveway or patio back to a safe level for a fraction of the cost of replacement. There’s no mess with Concrete Raising Corporation. They’ll clean up and leave your home looking great. Most jobs are completed within hours and won’t disturb your landscaping. Own a business? Concrete Raising Corporation specializes in commercial applications including leveling sidewalks, interior floors and parking lots. Raising and leveling concrete typically costs about a third to half of concrete replacement. How can Concrete Raising Corporation help you?